Are you heading to a party or picnic tomorrow? Did you leave dessert until the last minute? 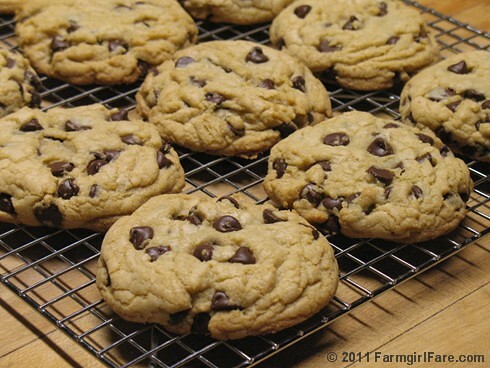 Here are two quick and easy favorites from the Farmgirl Fare recipe archives that also make great after school and lunch box treats. Enjoy! People get so excited over these Quick and Easy Raspberry Almond Bars it's almost embarrassing to admit how easy they are to make. You use one batter for both layers, and the filling is simply jam. They transport well, can be eaten out of hand, won't melt in the heat, freeze beautifully, and always garner rave reviews. And of course everybody loves homemade chocolate chip cookies. I make Nigella's Big Chocolate Chip Cookies two ways, and both are hard to stop eating. © FarmgirlFare.com, where we'll be, appropriately, spending Labor Day morning working the sheep (time to get ready for breeding season! ), but taking the afternoon off sounds like a really good plan to me—especially if it involves a nap. And cookies. After reading this post I think I'll re-think chocolate cake for my birthday and make this delicious treat! Thank you for your inspiring blog! I've made both of these in the past - and I can honestly say - "DEE-LICIOUS!!" Thanks for the reminder-I think I'll make them again! 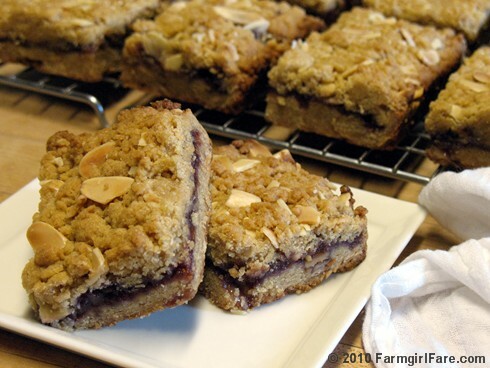 Made the "Quick and Easy Raspberry Almond Bars" last night for our Labor Day picnic. Seemed to go over well. I only got one piece today.